Stop using yesterday’s data to make today’s decisions. SAP HANA in-memory database can help execute a futuristic analytics with fast-moving transactions and get accurate, up-to-date responses quickly. The in-memory database removes lag between operational and decision support systems which is instrumental to have the real-time data at our fingertips. SAP HANA leverages graphical modeling tools and pre-built business function libraries to create multiplex business logic. We can embed our logic into stored procedures and run it inside the database to avoid unnecessary data movement. The algorithms run quicker in SAP HANA as models take advantage of highly optimized in-memory calculation engines. With SAP HANA multitenant database containers, we can manage multiple databases as one. We can allocate devoted resources for each tenant to improve database performance and lessen costs by backing-up, patching, and recovering all databases at once. By running multiple tenant databases as one, we can minimize costs, optimize system resources, and simplify database security and maintenance. With SAP HANA dynamic tiering, the often accessed data remains in memory, while seldom accessed data is moved to disk. 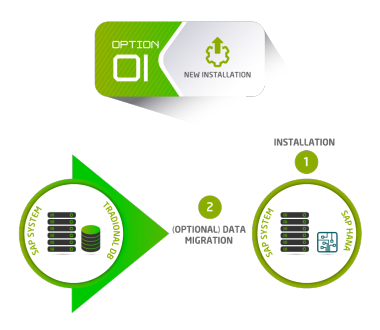 This lets us cost-effectively manage large data volumes without being limited by memory size. Our applications can access all data independently of where it is stored and we can modify our database storage preferences at any time to meet user expectations. Royal Cyber has seasoned Hana consultants to help you on migration.